Strawberry aphid is the main vector of strawberry virus diseases in Nova Scotia. Strawberry aphid monitoring began in early spring and will continue into the fall as part of a provincial funding program with HNS and Perennia. Populations have remained low throughout the summer in managed strawberry fields across the province. With that said, we typically see a "blip" in September of increased numbers, so be sure to continue to protect next years fields. The large raspberry aphid is the primary vector in NS of bramble viruses that are responsible for decline in cane vigor and decreased fruit quality. Monitoring activities have found them in commercial fields and at field edges in wild bramble. Their size makes them easy to scout with the naked eye. They can be found at the tips and undersides of newly expanded leaves where tissue is supple. Given the prevalence of wild bramble that are potential sources of virus, it is important to monitor and protect fields if you have a confirmed population of aphids. Potato leafhopper was first found in early July and has now been found throughout the Annapolis Valley and the south shore (Erika Bent, APM Agricultural Pest Monitoring Consulting Ltd). Adults (see photo) and nymphs are present in apple orchards, strawberry and raspberry fields. Feeding by the leafhoppers results in yellowing and crinkled leaves (see photo) and they are able to transmit aster yellows and green petal in strawberry. Nymphs and adults can be found by looking on the undersides of the leaves; nymphs walk sideways when disturbed. 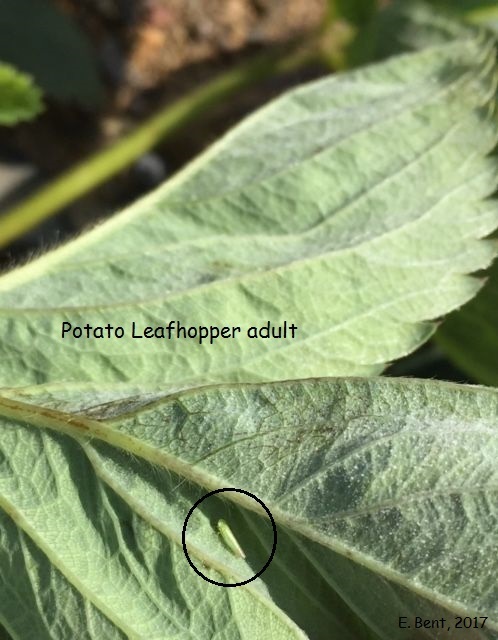 Potato leaf hopper adult on strawberries. Sharp-nosed leafhopper is able to transmit stunt in highbush blueberries. Erika Bent (APM Agricultural Pest Monitoring Consulting Ltd.) has been finding adults on yellow sticky traps throughout the Annapolis Valley over the past couple weeks. Controlling the leafhopper will help reduce the spread of stunt, but not eliminate it. Infected plants should be removed and destroyed.